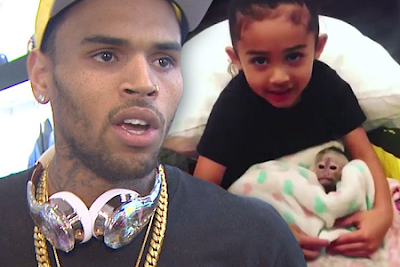 Chris Brown knows better than to give his daughter, Royalty a pet monkey. Sources close to Chris say the baby capuchin monkey everyone saw his 3-year-old daughter cradling actually belongs to Chris and not Royalty. He bought the exotic pet about 2 months ago and her name is Fiji. It was earlier reported Chris got skewered online for appearing to have bought Royalty the monkey, with scores of fans saying the monkey posed a danger to Royalty, and belongs in the wild. It’s been said Fiji's permanent address will be CB's crib, and that's the only place Royalty will get to see her. The monkey's not allowed to go to her mom, Nia Guzman's house. While that might ease safety concern's for Royalty, Fiji still won't be in the wild.